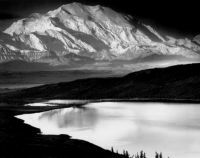 Ansel Adams, landscape photographer and environmentalist, was born in San Francisco on February 20, 1902. Though he and his family survived the great earthquake of 1906, he was permanently marked by the event when one of its aftershocks threw him to the ground and badly broke his nose. A year later, his family's fortune evaporated as result of the financial panic of 1907. This sudden loss of affluence seems to have effected his parents more than it did him. 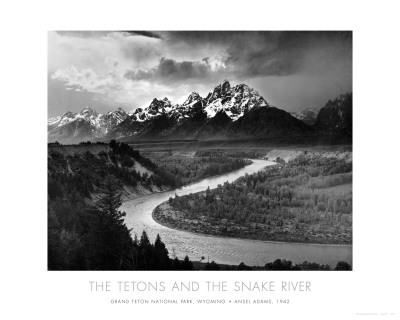 Ansel Adams seamlessly fused extremes of smoothness and ruggedness in “Mt. McKinley Wonder Lake, Denali National Park, Alaska, 1947.” Transforming simple black and white photography into an intricate art, Adams (1902 – 1984) expertly blended contrasting textures, forms, shadow and light. An adamant environmentalist, Adams used his photos to raise awareness about preserving nature’s beauty, and served as a Sierra Club Director.